Cunard Line’s 2,101-berth Queen Elizabeth set off from Southampton on January 3 on probably her longest deployment since she was delivered in 2010. This will take her to South Africa, Australia, New Zealand, Japan, Canada, Alaska, the Panama Canal and back to Southampton. Then, on November 3, she will head back to South Africa, Australia, Japan and Alaska again. She is now en route from Funchal to Walvis Bay. The Queen Elizabeth is offering a spring Alaska season this year with 10-night voyages leaving Vancouver on May 21 and 31 and June 10 and 20 for Skagway, Juneau, Ketchikan and Sitka, as well as Tracy Arm or Endicott Arm, Icy Strait Point, Hubbard Glacier and Victoria BC. Based on the the very high demand for these voyages, the Queen Elizabeth will return to Alaska cruising from June through September 2020, offering Cunard’s first full Alaska season in many years. This will include ten round-trip voyages from Vancouver. At each end of her 2020 Alaska season, the Queen Elizabeth will offer Pacific crossings from Yokohama to Vancouver and then back from Vancouver to Tokyo. This final trip will leave Vancouver on August 29 and arrive in Tokyo on September 28. Meanwhile, in 2019, the Queen Elizabeth offers a selection of one-way voyages from Vancouver to San Francisco and Los Angeles. Two departing on June 20 will include the full Alaska cruise and finish in San Francisco after thirteen nights or Los Angeles after fifteen. Two more pure coastal voyages will be offered from Vancouver on June 30, sailing to San Francisco in three nights or Los Angeles in five. 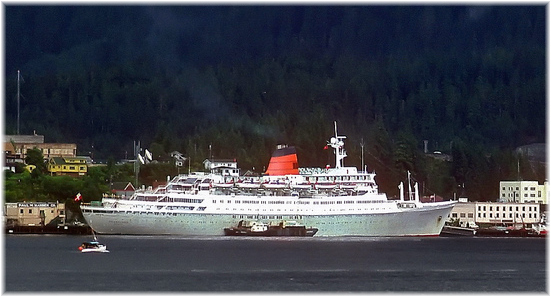 On her way to Alaska this year, the Queen Elizabeth will offer a 17-night crossing from Yokohama on May 5, bound for Vancouver via Aomori and Sapporo, Japan, while in Alaska she will call at Kodiak, Seward and Juneau en route. The Pacific crossing will also be offered as a 35-night cruise from Sydney, departing on April 1. This follows an extensive series of fourteen cruises from Australian ports. The Queen Elizabeth will berth together with the original Queen Mary when she calls at Long Beach, where the latter ship has been preserved since 1967. Queen Mary 2 made her first visit to Long Beach in 2006 and Queen Victoria in 2011 while the Queen Elizabeth first called there in 2013. 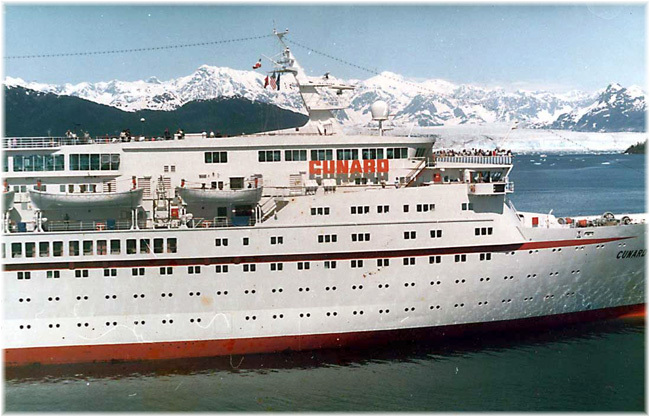 The 2019 Alaska cruises are the first to be offered by Cunard Line since the 950-berth Cunard Princess in the 1980s, the 589-berth Sagafjord in the 1990s and the 820-berth Crown Dynasty in 1997. 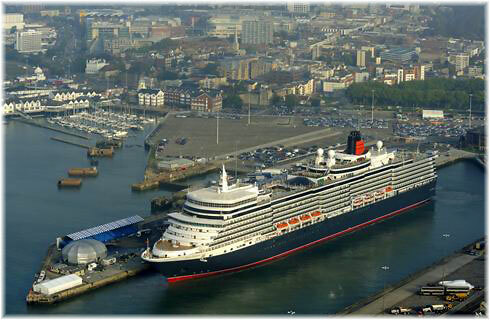 Cunard is due to take delivery of a new 3,000-berth ship, the biggest Queen ever, in 2022. Whether she will be named Queen Anne or Queen Charlotte, or given some other name, is an interesting guess at this stage. Queen Anne (1665-1714) was the last Stuart monarch and was famous for having brought about the union of England and Scotland into Great Britain in 1707, as well as having ended the War of the Spanish Succession. Queen Charlotte (1744-1818), meanwhile, was queen when King George III united Great Britain and Ireland into the United Kingdom of Great Britain and Ireland in 1801. The Queen Charlotte Islands of the British Columbia coast were named for her. Norwegian Cruise Line Holdings last week announced an order for the next generation of ships for Oceania Cruises. The two “Allura” class ships will mark the next phase of the line’s expansion, and will be designed and built by Fincantieri for delivery in 2022 and 2025. “We are excited to expand the Oceania Cruises fleet with our new ‘Allura’ class ships to meet the strong demand for upscale culinary – and destination-focused cruise vacations around the globe,” said Frank Del Rio, president and ceo of Norwegian Cruise Line Holdings. The two 67,000-ton “Allura” class ships will each accommodate about 1,200 guests. This new class of mid-size cruise vessels will retain the warmth, popular design elements, and signature amenities of the line’s award-winning 1,250-berth Marina and Riviera while affording guests an elevated level of comfort and convenience with the addition of new luxury offerings. “This new class of ships will represent an evolution of the Oceania Cruises experience with all of the elements our guests treasure – a warm, intimate, residential style; the most spacious standard staterooms afloat; amazing suites, and of course, the finest cuisine at sea,” said Bob Binder, president and chief executive officer of Oceania Cruises. The contract price for each of the two vessels is approximately €575 million per ship. The company has obtained export credit financing with favourable terms to fund 80% of the contract price of each ship, subject to certain Italian government approvals. Norwegian Cruise Line Holdings now has ten ships on order for delivery through 2027 including seven on order for Norwegian Cruise Line, two for Oceania Cruises and one for Regent Seven Seas Cruises. The Company will take delivery of its latest ship, Norwegian Encore, this autumn. 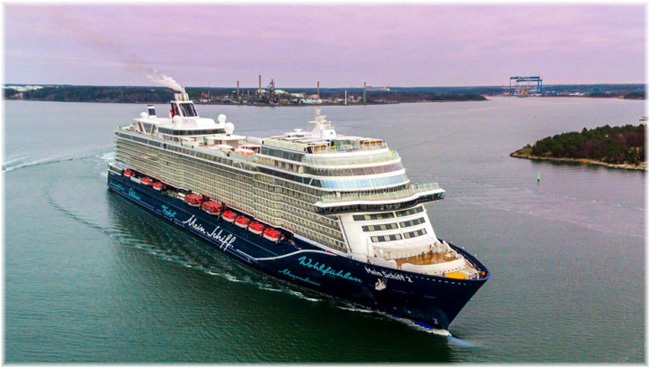 The newbuild Mein Schiff 2 has sailed under her own power from Finland to Kiel, Germany, where she arrived on January 5, still under Finnish flag, as she has not yet been delivered. The yard decided to move her to Germany for final fitting out and last trials, as the yard in Finland is starting to freeze up. Sistership Mein Schiff 1 needed the help of a large icebreaker to exit the yard in Turku, so Meyer is looking to avoid that expense with Mein Schiff 2. 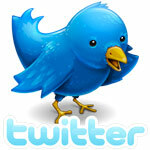 Official handover is planned for next week, January 22 at Kiel, followed by a travel industry cruise to Hamburg. The first official cruise will leave Bremerhaven on January 29, followed by christening festivities in Lisbon on February 9. The current Mein Schiff 2, the ex-Celebrity Mercury, will be renamed Mein Schiff Herz before delivery of the newbuilding that will take on her name. Mein Schiff 1 is the former Celebrity Galaxy. 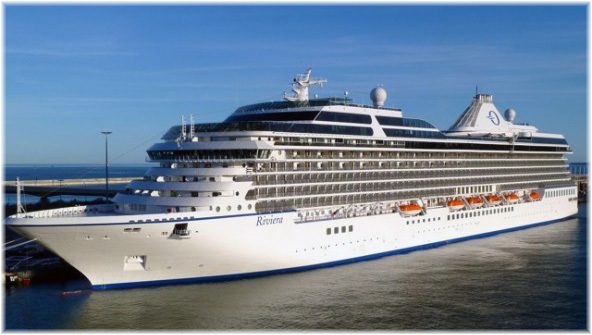 The Riviera is 66,000 tons, 1,258 passengers, smallest cabin 17 sqm. largest lead-in cabins afloat are around 28 sqm!! They should not call it “marketing” – this is hyperbole.